Been doing a LOT of my favorite kind of craftwork; combining old and upcycled with new. Most of these things you may have already noticed in the last post with the pictures of my space at Stars, because that is where most of it went. But I’ll tell you HOW I did things here, and show you the ‘befores’. 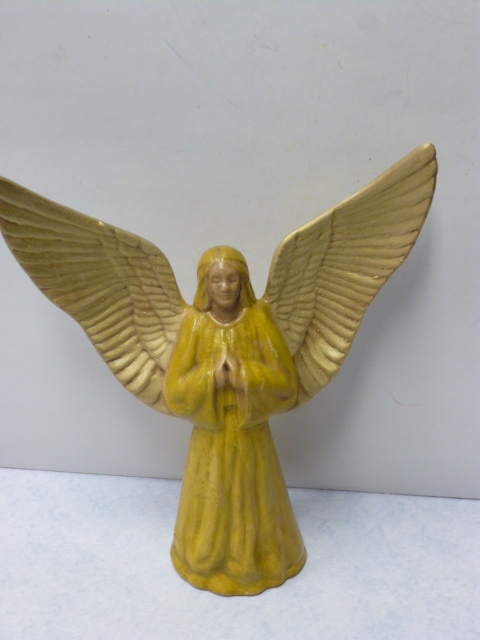 This angel has a rather grim look on her face, but I LOVED her widespread wings! And she was inexpensive enough to risk if her makeover didn’t turn out as I’d envisioned it would. First I just spray painted her white. (craft paints would have worked fine too. We just had a short break in the rain so I WANTED to go outside!) 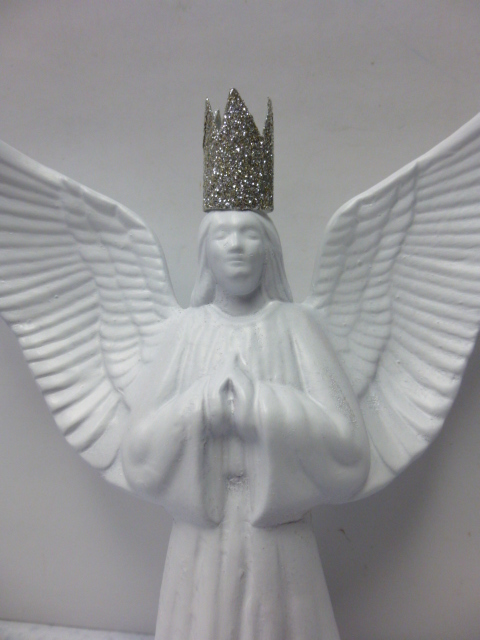 Pondered adding some ‘pixie dust’ varnish to her wings . . . .
Decided on a crown instead. It distracts from her face enough that is doesn’t appear as grim; to me at least! 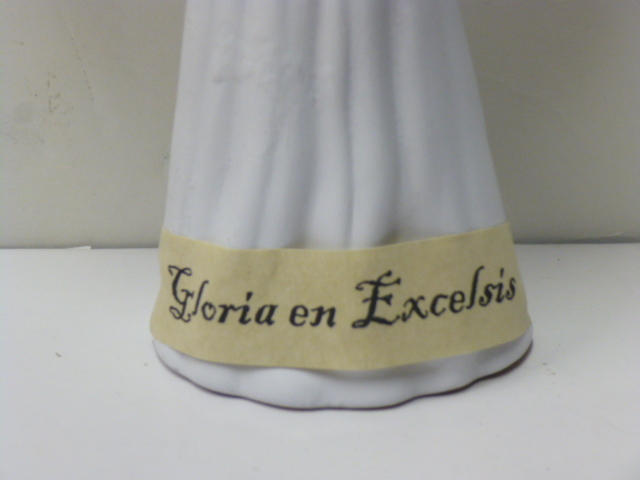 I had a bunch of these little tags leftover from last year’s ornament production (printed them on my computer and cut them out by hand) Thought this “Gloria en Excelsis” one suited her. And this is how she ended up. 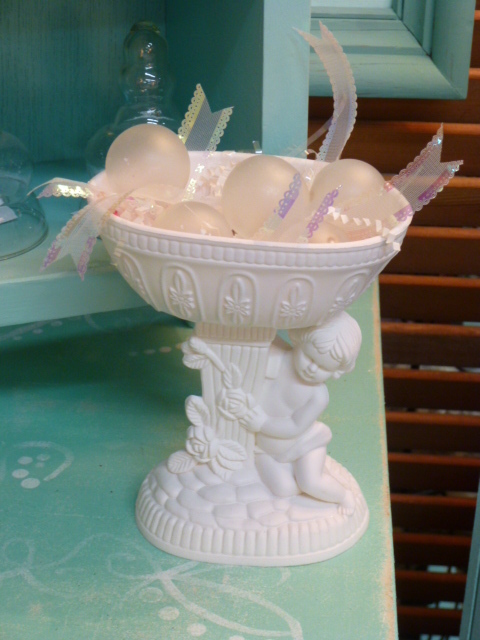 This is a PLASTIC vase. 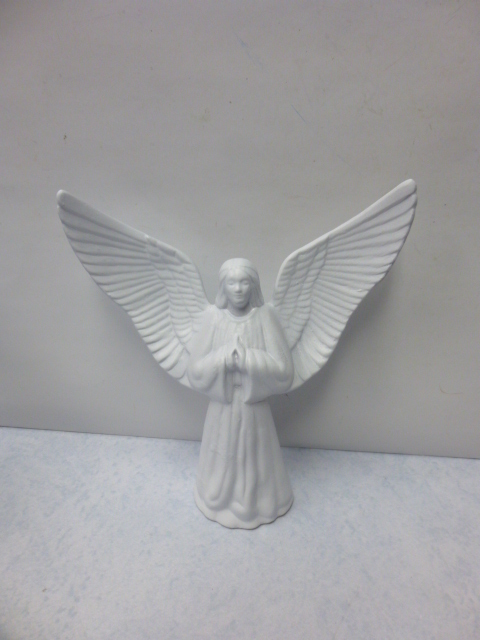 Was a tad dirty even after I scrubbed and bleached it, so I gave it a quick coat of white spray paint at the same time I was painting the previous angel. Painting over vintage plastic stuff is a good way to make it LOOK more like ceramic too. First I stuffed the base (it went down to the very bottom!) with styro peanuts up to the bowl part. 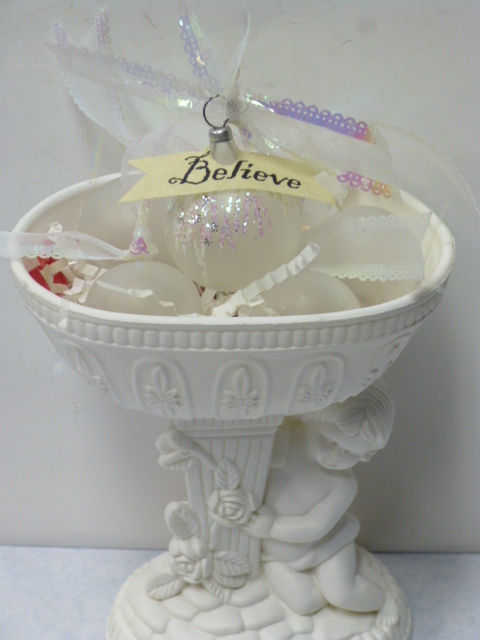 Tossed in a grabful of my own hand made paper shred basket filler, and added some frosted glass balls and one ornament (all thrifted!). 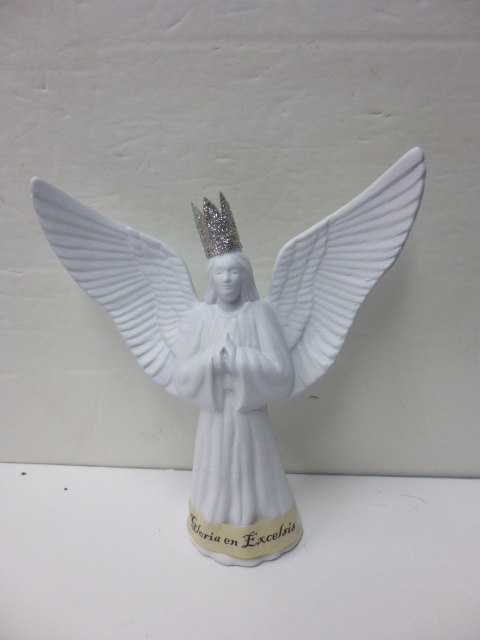 Then added a little tag to the ornament. 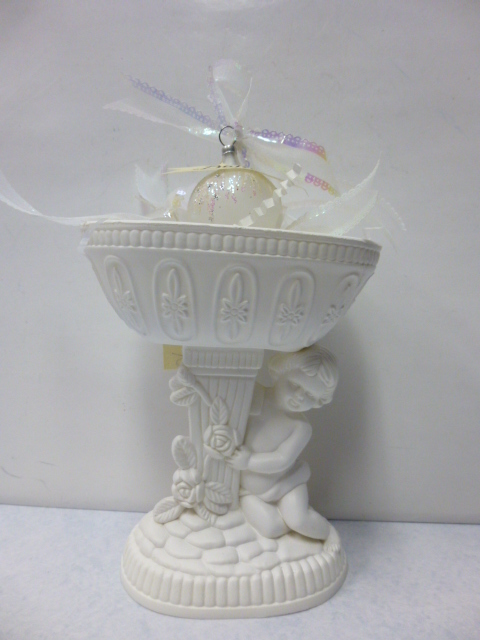 Alas, the ornament broke in transit to Stars, even though I had wrapped it VERY carefully. 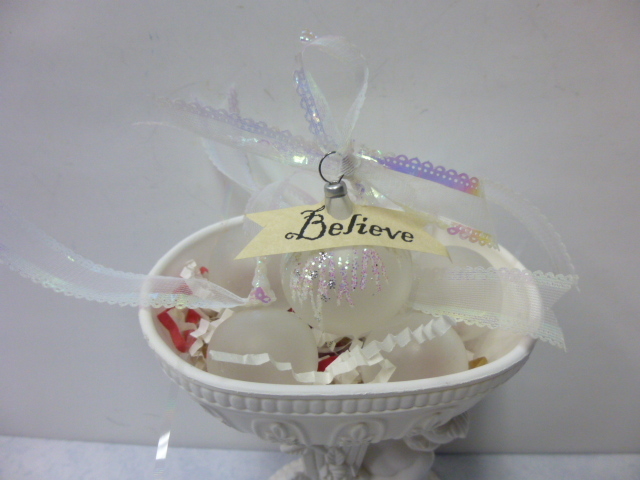 But it still looked okay with just the frosted balls. I may take a replacement on my next trip, if it hasn’t already sold! 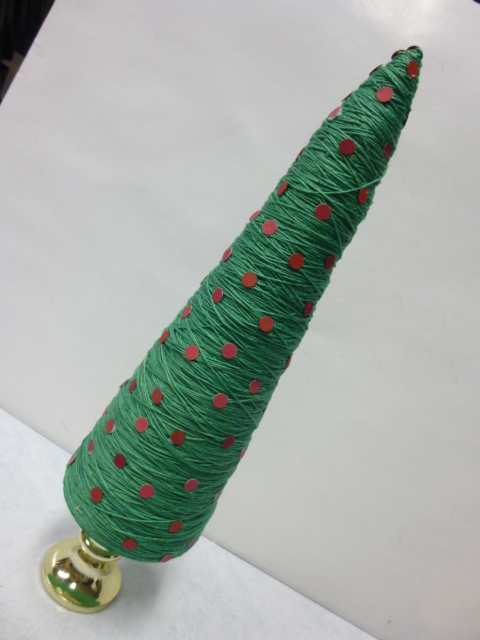 Crochet thread and styro cone tree with paper punch ornaments. 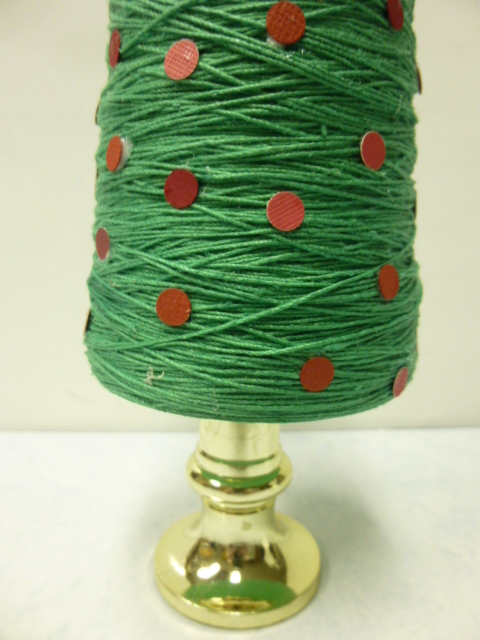 There were a couple of spools of green crochet thread mixed in with a big bag of whites and creams that I bought at the thrift store recently. Oftentimes I’ll just donate the colors I don’t want back to the thrift store on my next trip. But I saw some cute string cone trees on Pinterest, and I had these candle bases leftover from a previous project (bases from the electric windowsill candles that I only needed the candles on) so I decided to try one. I just added a cone of paper to the top of my styro cone since it was flat and I wanted my tree pointed. 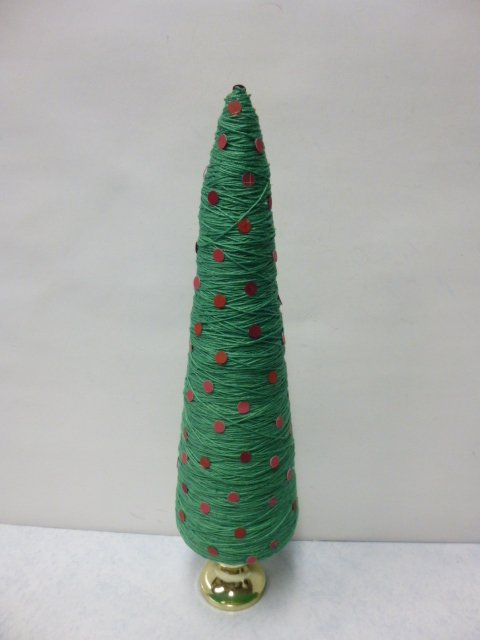 I blued a matching piece of green cardstock to the bottom of the cone, then I just started wrapping. And wrapping and wrapping . . . I actually used the WHOLE thing of green crochet thread! The red ‘paper punches’ were confetti that came in a gift set from a friend last year. I just ‘dotted’ tacky glue on the tree, about ten dots at a time, then stuck the dots to the glue. Kind of Dr. Seuss-ish, don’t you think? 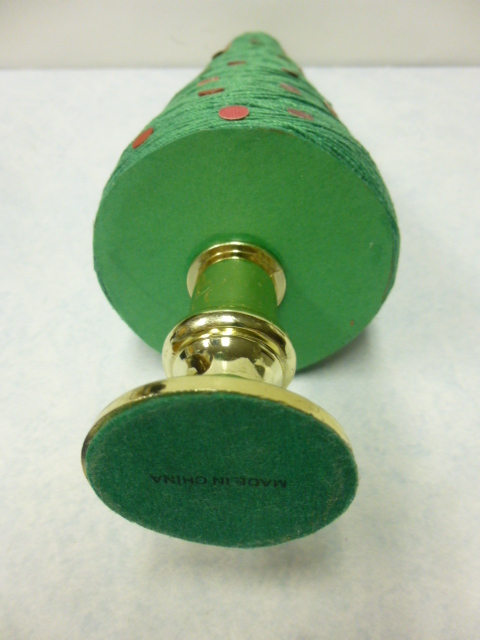 Cloche made from an inverted candle holder; glued knob on with e6000 as a handle. 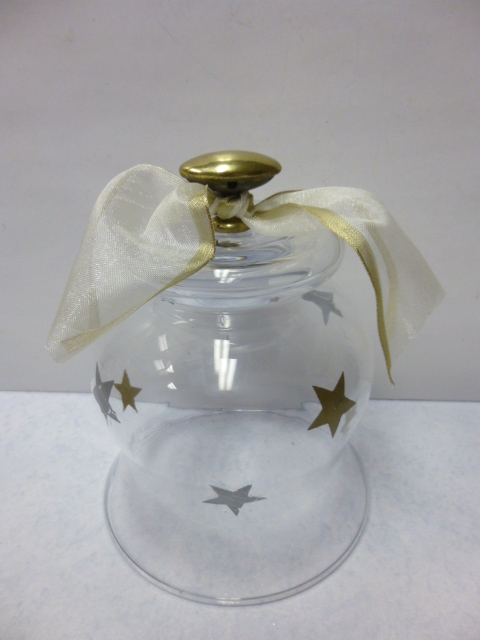 Tiny cloche made from a smaller candle holder with glass knob (formerly a spice jar top with the plastic tip removed!) 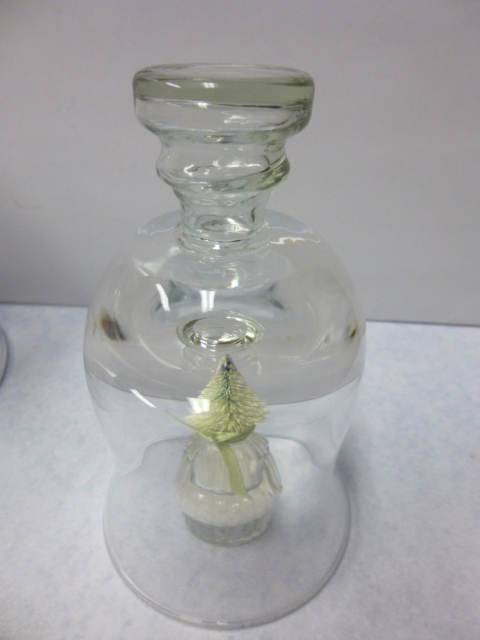 Tiny bottle brush tree in a tiny salt shaker under the cloche. 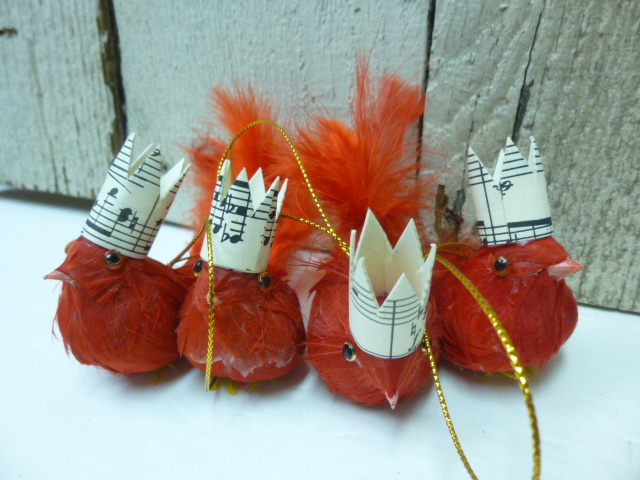 These little red feather bird ornaments with crowns are for sale in my etsy shop. Adding quite a bit more Christmas gifts and decor over the next week. Be back with more of my recent crafts in a couple of days. Right now I’ve got to CLEAN house and BAKE goodies for OUR Thanksgiving dinner with my son and his girlfriend, tomorrow.